Looking for a USED CA6266C/3000? Yantai Mainland Numerical Control Machine Tool Co., Ltd is a professional manufacturer and exporter of CNC machine tools. We are located in No. 6 Hangzhou Street, Haiyang Economic Development Zone, Haiyang, Shandong, China, with convenient traffic environment. At present our company covers an area of 230,000 square meters and existing assets is about 0.95 billion RMB. And we also have two branches in Taiwan and USA . Yantai Mainland Numerical Control Machine Tool Co., Ltd follows the concept of independent innovation, leading technology and employs many senior engineers to establish efficient R&D team. We are going after domestic and overseas market to develop more new products to meet market demand. And we have obtained the quality certificate of GB/T19001-2008, environmental management certificate of GB/T24001-2004 and occupation health and safety management certificate of GB/T28001-2011. According to the needs of domestic and overseas markets, we have developed over 30 varieties, 4 series of high-tech, high added value and marketable CNC machine tool products which is CNC vertical machining center, horizontal machining center, CNC gantry machining center and CNC lathe. We are focus on exploring sales channel while developing new products to improve product visibility and market share. We absorbed professionals to establish import and export corporation and sales department. Company takes various measures to open up market, especially overseas market. "Bringing in" and "going out" closely together .And we have successfully to establish long-term cooperation with customers from USA, Germany, Russia, Brazil and Turkey, etc. 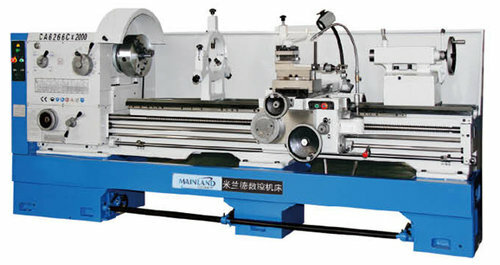 Now mechanotronics as main orientation of our company, high-precision and advanced CNC lathe, CNC milling machine and machining center as main products., in future development, we will aim at international advanced technology and optimize the use of resources from overseas market and high technical , by working hard and keeping up with times to make contributions for our national industry. 192 ModelsView more about Yantai Mainland Numerical Control Machine Tool Co., Ltd. Looking to Purchase a New MAINLAND CA6266C/3000?